We might have lacked quantity in the early part of this month, but we are making up for it with quality now. Some of the fish that have been landed over the past week have been fantastic. Numerous double figure Bass and lots of decent sized Smoothound, some of them into double figures. Add to the scoreboard several cracking Rays and you know the fishing is good. It will get even better over the next couple of weeks. We are still waiting for the main influx of the smaller but tastier summer species. Gurnard and Bream are showing in small numbers, but should start to show regularly in catches. 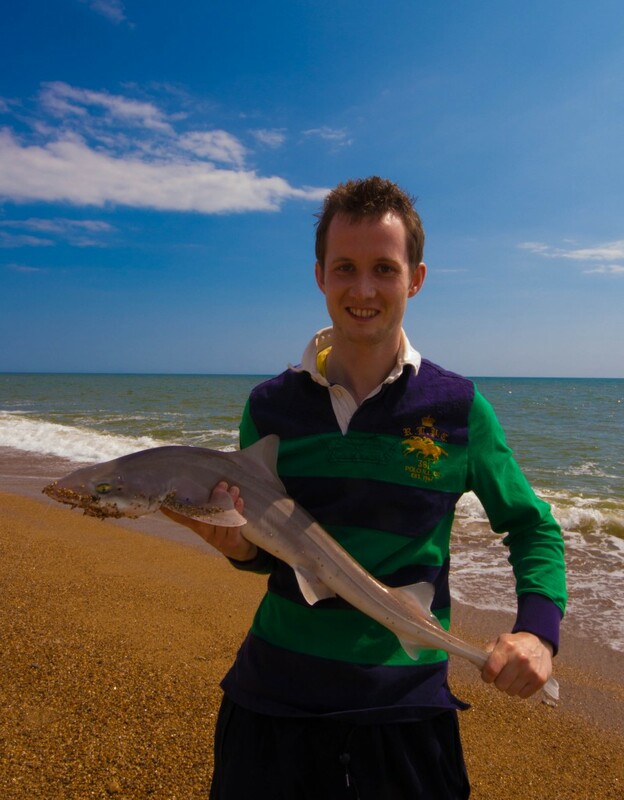 I have heard several reports that there have been a quite a few small Tope caught from Chesil recently. Most of them have only been around a 1lb. They are not seen very often from Chesil. It would be nice to think that they might make a regular appearance, especially when they get larger. I am looking forward to landing some of the more exotic summer species that we have here regularly. 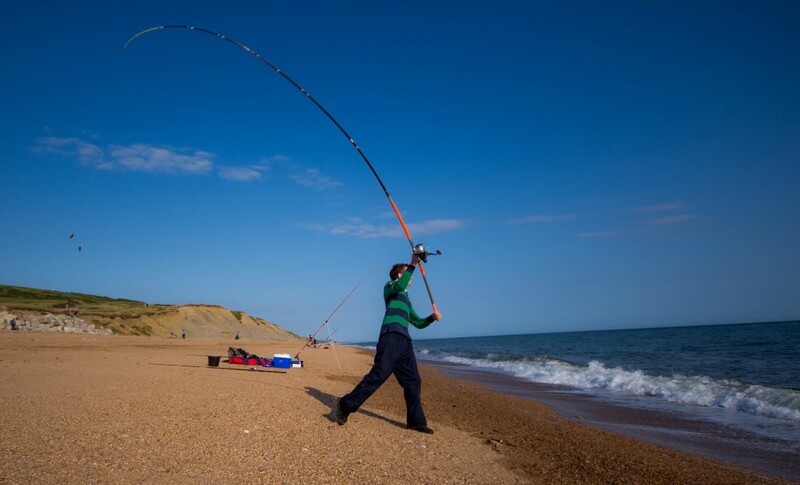 Chesil Beach is one of the few marks in the UK where Trigger Fish are caught every summer. They are incredibly hard fighting for there size and fairly easy to catch. They can be found on almost any of the Wrecks along the beach. They also like rocky areas, with several normally landed around Portland. In Portland Harbour we have a population of Gilthead Bream, that can grow up to 10lb. It is not just lure guiding that I do, I have been doing quite a few bait sessions recently. I had another good session yesterday, with one of my clients landing himself some nice Smoothound, the largest was 8lb. You wont be surprised when I say that they were all caught on Peeler Crab. I managed to film some good video of the session, which I will put together when I get time. I am hoping that the fishing is as good tomorrow for the River Cottage Shoreline course. Chesil Beach forecast: I would expect the Mackerel to show back up again today and with them some more Bass. A few nice Plaice have been caught at Cogden along with Undulate and Small Eyed Rays. I know it is a bit of a hike from the car park at the top, but it can be worth it. Easier options are Abbotsbury and West Bexington, both should start to fish really well now. Towards the Portland end of the beach, Bream and Gurnard should be caught regularly during the day alongside Smoothounds. Fishing right in Chesil Cove there are plenty of Wrasse and Pollock, but I did see lots of Spider Crabs being caught. Portland: With good water clarity the Wrasse fishing has been really good and I expect it to remain so. Lure fishing fr Pollock, Mackerel and Garfish around the Bill has been very good, even during the day. As usual dawn and dusk are the best times of day for Pollock fishing. Me and my friend Ben were fishing just down the beach for you on the 25th I did see that smoothound being landed if you look in the first photo you may spot us in the back ground, we had a good days fishing with dogfish and 4 nice small eyed rays biggest I would gess was well over 10ld all on sand eel . Well done of the Rays. It was a nice afternoon session and we enjoyed. If you have a picture of any of them send it in for fish of the month.